Among Nerf's many competitors, there are a few that have upped the ante in terms of blaster quality. Prime Time Toys, with their Dart Zone Covert Ops blasters, is in that group. 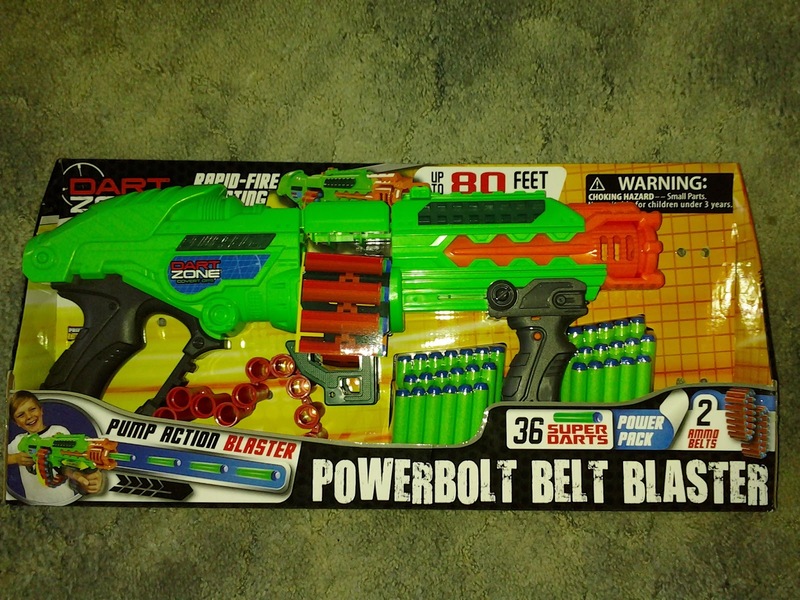 The Powerbolt Belt Blaster only reached Target shelves within the last month, and even then has (as of this posting) reached only 15% of stores nationwide in the US. It's a shame, because the Powerbolt is both fun to use and decently powerful, all for only $20. 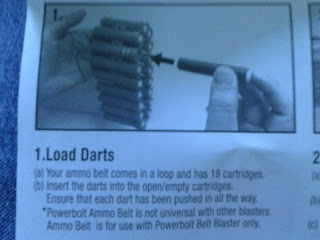 The Powerbolt comes with two 18-dart chains, 36 darts, and 80' range claims. It's a rather bright green, and looks a bit more like something out of a sci-fi movie. 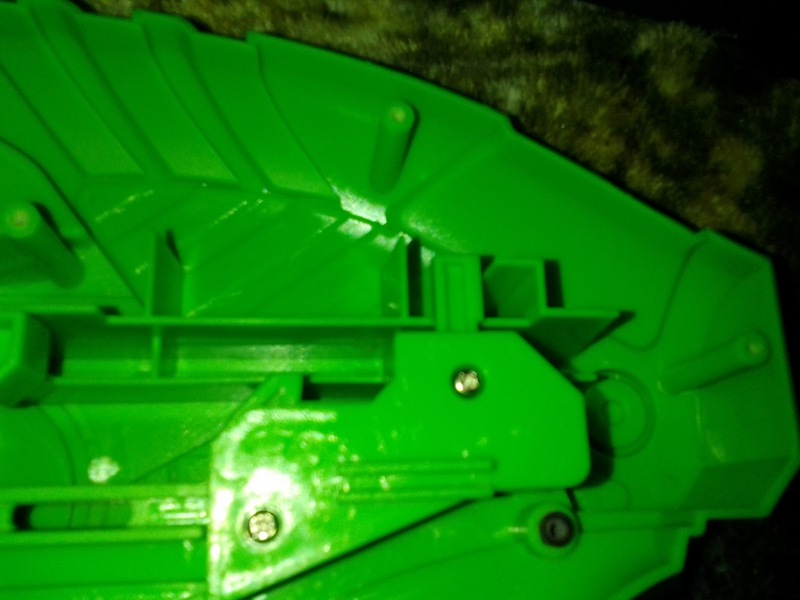 One bit of sad news: the belts for the Powerbolt and Scorpion are not interchangeable. Let's look at the blaster itself. 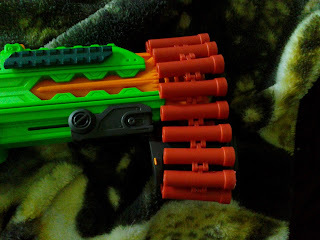 It's a triggerless blaster which fires once you pull the charging handle all the way back. Pushing the handle forward resets the plunger system and moves the chain by a link. The front handle can fold up and forward. Why? That's how you load the chain onto the blaster! It takes longer than swapping clips, but belts are still more satisfying to use. Not to mention that you can reload your belt on the fly without removing it. Opening up the blaster, you can see the priming bar travels through the rotation mechanism. The plunger measures 1 1/16" ID, with a 2 1/8" plunger draw. 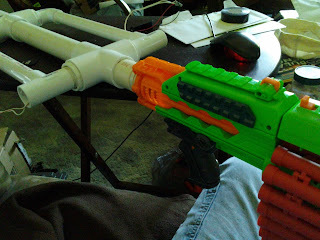 The blaster fires by pulling the plunger with the catch, up until the last bit of movement. The ridge at the rear of the shell forces the catch to pivot, releasing the plunger. 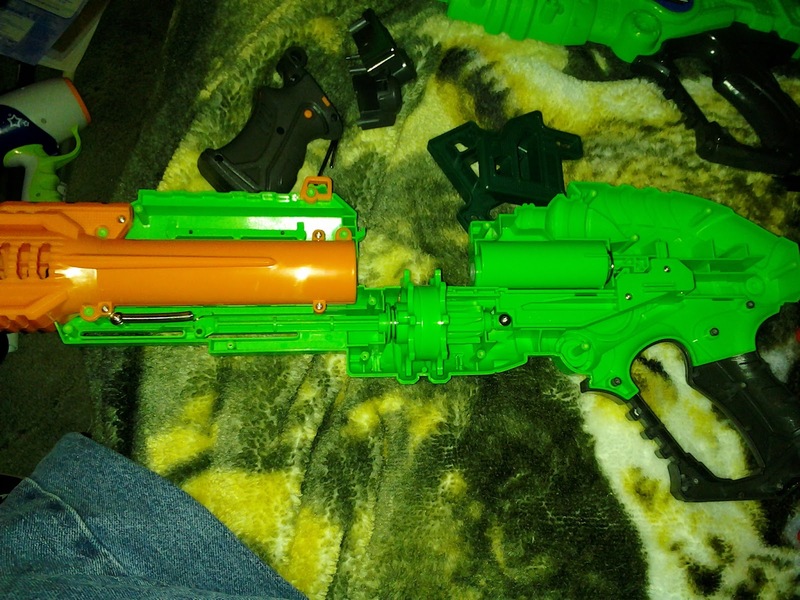 It took a while to get accurate readings, but my blaster averaged 74 fps on the chronograph. Outdoors, darts landed between 65' and 85'. 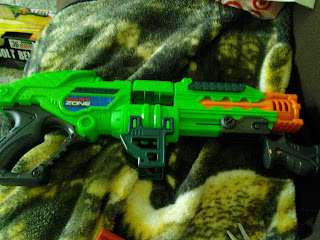 Accuracy was relatively poor, although that's expected from a slamfire-type blaster. 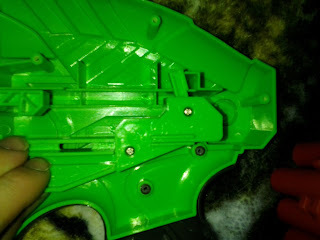 You can, though, hold the priming handle part of the way back, aim, and then finish pulling to minimize dart spread. In the end, there's just nothing like dumping a chain of ammo downrange, regardless of hitting your target. 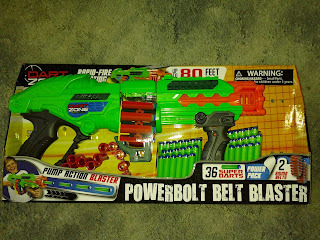 The Powerbolt Belt Blaster does that, and with much less noise than the Dart Zone Scorpion. 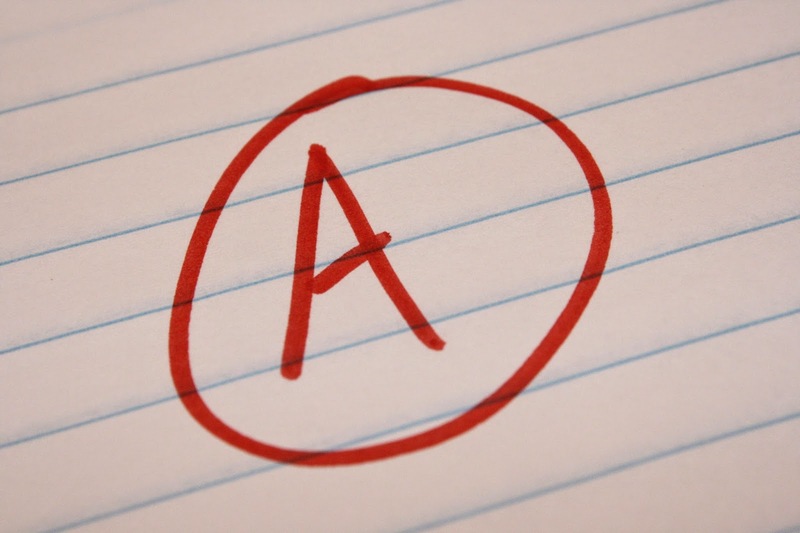 Ranges are good, and (with an edit coming soon concerning modification) can be made better with the right spring. It may not be as effective against other blasters with triggers, but there'a a good chance you won't mind.